Invisible braces for adults with busy lives. No one will know you’re wearing them! Would you like orthodontic treatment but are put off by the thought of wearing noticeable braces? At Bhawani’s Dental we are an accredited provider of Invisalign® invisible braces. Invisalign® is invisible, removable and comfortable. 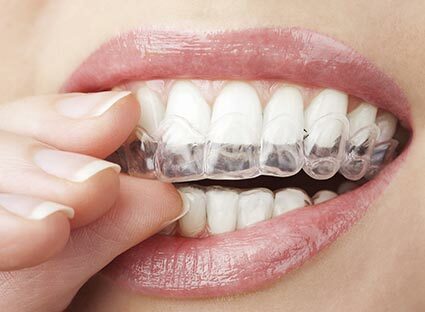 Invisalign® is one of the new generation of discreet orthodontic treatments available today. It works by using a series of invisible, removable and comfortable aligners. No one will even know you’re wearing them because the clear plastic material they are made out of is virtually invisible. The fact that they’re removable is another real advantage for those with busy social and work lives. Although they should be worn as much as possible to ensure quick treatment, you can leave them at home for special social occasions or for that big presentation at work. The aligners are custom made for your teeth from an impression we’ll take at your initial consultation. Each set of aligners must then be worn for approximately two to three weeks. After each two to three-week period we’ll give you the next set. Each set of aligners builds on the work the previous set has done to gently bring your teeth into their new, straighter position. Do you want straighter teeth without having to wear unsightly metal braces? Why not give us a call on 01925 768 111 and book your first Invisalign® consultation appointment today!